Send us an email to book direct, best price guaranteed. So please contact us and we will get back to you rapidly with our best price. ﻿We may have availability when online booking companies don't. you can use the link below. But please wait until we have confirmed your reservation, and asked for a deposit, or you have requested to pay in full. 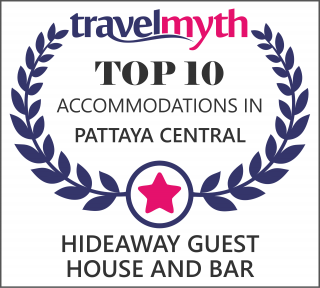 The Hideaway Pattaya Guest House and Bar is situated in the heart of Pattaya, in the Soi Buakhow area. We are in close proximity of Walking Street, Beach Road, 2nd Road, LK Metro, Action Street, Made in Thailand and all of the busiest parts of Pattaya City and it's renowned nightlife. We have friendly staff who will look after you during your stay. Our spacious rooms are fully equipped with air conditioning, blackout curtains, tea/coffee making with complimentary tea and coffee. Large refrigerator, 40" Smart TV. High quality Free wifi connection in all rooms. En suite toilet and shower. Daily maid service, towels and linen included in price. No extra charges for water or electricity. Taxi scooters and Baht Buses only yards away from the guest house. The bar stays open late. We have recently opened "The Rib Shack". Serving Barbecued Ribs, mixed grills, sausages chicken plus daily specials including popular thai dishes and western favourites. Opens at 5pm, but from March 2019 will be open from 9.30am serving all day menu, including a range of breakfasts. ​We opened in July 2015. As of February 2016, we reached the Top 5 Pattaya Guest Houses on TRIP ADVISOR and aim to to stay in the top 5. Already very happy with the way things are going, we will strive to add and improve constantly. We listen to all customer feedback, and react if and when we think something can be changed or altered for the better. Andy and The Hideaway Staff. PLEASE SIGN OUR GUEST BOOK PAGE IF YOU HAVE ALREADY STAYED WITH US. AND PLEASE LEAVE SOME COMMENTS ON OUR BLOG PAGE. Every Wednesday night (unless Kev is abroad) there is a subscriber meet up at The Hideaway. This starts at 8pm and goes on till late. Kev is there from 8pm, and the Hideaway lays on hot and cold food for all at around 8.30pm. Sometime after midnight, there is often a baht bus commandeered, and Kev takes a crowd to one of his favourite GoGo bars. A good chance for new visitors to Pattaya to go to a Gogo bar with some regulars. Please check out ﻿﻿Kev's channel﻿ ﻿and become a subscriber if you like the videos.